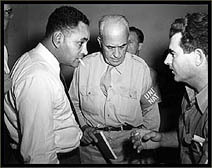 Ralph Bunche's successful negotiation of four armistice agreements that ended the first Arab-Israeli war in 1949, proved that the United Nations could fulfill its peacekeeping mandate. This was the first major challenge faced by the UN, and a great deal was at stake for the new international organization. Bunche believed passionately that conflicts could be resolved through negotiation, without resort to the use of force. He dedicated more than twenty years of his life to achieving the goal of international peace. He worked tirelessly to resolve seemingly intractable conflicts in such varied places as Palestine, Yemen, Kashmir, Cyprus, Suez, the Congo, and Bahrain. In many cases, his negotiations prevented the outbreak of hostilities and as such did not make headlines. For Bunche, the peaceful settlement in Bahrain further evidenced the power and efficacy of mediation rather than open conflict - the defining feature of his world view. In the end, the British Mission believed that "the main credit goes to Dr. Bunche, whose good will, patience and skill were truly exemplary."